The Korea Herald is publishing a series of articles featuring inter-Korean relations to mark the paper’s 65th anniversary that falls on Aug. 15. Following is the seventh installment. – Ed. South and North Koreans have lived in separate social systems for well over half a century, and among the most notable disparities between them are their different views on Korean history, which is ironic considering they shared essentially the same history until the 1950s. Historians here believe the joint archaeological dig of the ancient kingdoms on the Korean Peninsula, the subsequent joint study of the uncovered relics and regular exchanges of academic opinions on the matter across the border will help narrow the gap. 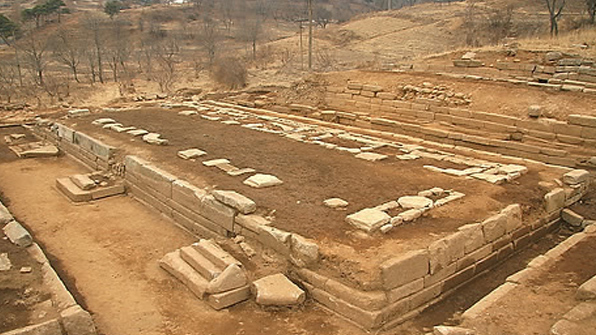 Spearheading the mission is the excavation of the Manwoldae site in Kaesong, which has seen indications of being resumed in the near future after being put on hold for the past three years. Manwoldae is where the royal palace of Goryeo Kingdom stood until it was obliterated during the Red Turban invasion in the 14th century. The ancient kingdom’s capital Gaegyeong is located in North Korean territory --and is now called Kaesong -- but South Korean scholars say the study of Manwoldae is critical in helping them understand how Goryeo royals lived. The two Koreas first agreed in 2006 on the dig and commenced the project the following year, after which South Korean scholars visited Kaesong in 2008, 2010, 2011, 2014 and 2015, when they carried out the longest dig of six months. During the six-month period, they discovered 19 building sites and 3,500 relics, including a Goryeo-era moveable print type. “People who studied Goryeo in South Korea could only read the references about what its palaces looked like. But the excavation showed us how the relics were arranged, allowing us to presume the actions of the royals who lived there,” said Ahn Byung-woo, who heads the Goryeo committee at the Inter-Korea Historian Association. Ahn said that the two sides agreed informally to continue the excavation -- except when made impossible by weather conditions -- but the plan went up in smoke amid Pyongyang’s nuclear ambitions and icy relations across the border. Last month, however, local media reported that scholars in the North had expressed the wish to resume excavation. “We haven’t specifically agreed on when to resume the dig, other than to clarify that both sides want this to happen,” said Ahn. Following the report, the Unification Ministry said that it was reviewing the case so as to not violate international economic sanctions on North Korea, precipitated by its nuclear and ballistic missile programs. The South would have to cover the costs, expected to be in the range of 1 billion won ($881,000). “(The ministry) will cooperate with the international community within the range allowed by the current sanctions,” a Unification Ministry official was quoted as saying. The Cultural Heritage Administration said it is preparing to dispatch a research group into North Korea as soon as the government makes a decision. The Manwoldae project is expected to spark other research inside North Korea planned by the South Korean government, including an excavation of ancient Goguryeo Kingdom tombs in Pyongyang. The National Museum of Korea is also considering asking North Korea to loan out relics for the museum’s year-end exhibition, as it had done in 2006. More importantly, however, the archaeological dig is considered a critical step toward achieving historical homogeneity between the Koreas. Do Jong-hwan, minister of Culture, Sports and Tourism, said recently in a meeting with reporters that the ministry’s priority will be to be accomplish homogeneity between the two Koreas in terms of language, history and culture. Seoul and Pyongyang do not see eye to eye when it comes to history. Silla Kingdom is known here as the first to have unified the ethnic group of Koreans on the Korean Peninsula, with the latter part of its history referred to as Unified Silla. North Koreans who study with their history book, the “Joseon Ryeoksa,” deny the purported feat, as the Silla Kingdom failed to recover most of the northern territories formerly occupied by its once-powerful neighbor, the Goguryeo Kingdom. North Koreans believe themselves to be the direct descendants of Goguryeo. The North Korean history textbook is far more favorable toward Goguryeo and Goryeo, which were born in the territories now occupied by the North. This is presumed to give more authority to the Kim Jong-un regime, which, like those ancient kingdoms, is based north of the Han River and is surrounded by powerful enemies. Scholars say that such disparity in historical perspectives can be resolved via joint studies of ancient times. “The way (the relics) are interpreted may vary, but the site itself is an immovable fact. It is very important for scholars of both (Koreas) to jointly excavate and see these sites,” Ahn said. He went on to say this does not mean forcing the same interpretation on everyone.